Transform assessment into a powerful tool that inspires student learning. 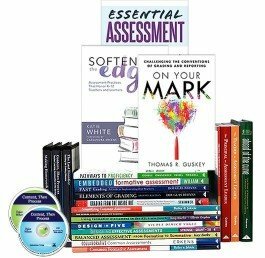 Curated by leading assessment experts, the toolkit includes twenty books and three DVDs for whole-school professional development. Access a complete collection of strategies and practices for involving students in the assessment process, integrating assessments into instruction, and ensuring reporting practices accurately measure student achievement. Each toolkit comes in an easy-to-carry display case. Build a comprehensive library of premium staff resources on assessment that easily adapt to meet the needs of your school or district. Discover research-based solutions for tackling any assessment-related challenge. Leverage tips, tools, and templates from experts proven to boost student achievement. Deepen your understanding of how to design assessments that support students while motivating them to succeed. Equip your staff with a variety of print and video resources flexible enough to meet the needs of adult learners.